Obituary for Christine Harris McDaniel | Collins Funeral Home, Inc.
Ms. Christine Harris McDaniel of Ridgeway, SC entered into eternal rest at Prisma Health Richland on March 23, 2019. She was born on August 17, 1950 to the late English and Annie Murphy Harris. Christine was like a mother to everyone's child. She was a giving person who was always willing to lend a helping hand. She worked for B.F. Goodrich over 35 years at the Elgin plant. 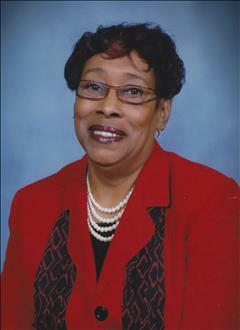 She was a life long dedicated member to the James Chapel AME Church family. She was preceded in death by her husband, the late James McDaniel, Jr; siblings, Ed Harris, Willie Harris, English Harris, Jr, James Harris, Edna Harris and Beverly Gripper. She leaves to cherish her memories, brothers, John Harris, Jerome Harris and David (Charlene) Harris all of Ridgeway, SC; nieces, nephews, family and friends. A special thanks to LaShawn Murphy and dearly devoted friend, Minnie Gripper.